* Our natural Hard Maple Train Table stands 20-1/4" high and comes with a two piece Baltic Birch top to encourage open ended play... no graphics that tell a child what to imagine. * Built for strength, as well as beauty, our original design easily supports all the weight you'd imagine it to encounte... and then some. 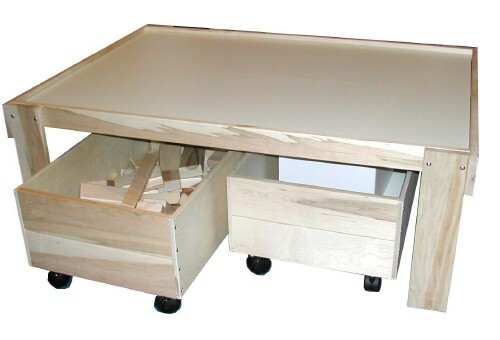 * The recessed top helps keep small toys and game pieces on the table.... and off the floo. * Our two-piece top allows for some wiggle room so installing the two pieces is easy, while finger pinches are avoided. * The Baltic Birch top pieces are designed for stability and will provide a great deal of strength over time. * The top area measures 32" x 48" so also accepts standard train table tops made by some of those other guys, should you want graphics. * The overall assembled dimensions are 35" x 49-1/2" x 20-1/4". Adult Assembly Required. 49.5" x 35" x 20.25"